“There is.” Dal’s fingers flicked across the keypad and a picture of a gigantic chrome hull loomed over their heads. “Exactly.” Dal slumped forward, clicking off the screens as if in resignation. “I have to.” James shot toward the door, adjusting his backpack. “I won’t.” Although the governor had always been a thorn in his side, James still worried about her and her family surviving the attack. Yes, she blew up Utopia and planned to abandon her own city, but she didn’t deserve to be taken out by the Razornecks. Besides, James needed some sort of structure until the Expedition took off and he could get to the Destiny. If the Razornecks gained control of the city, every street would go to hell. He pressed the panel and the sides parted, revealing a crowded corridor. “James, you never agreed to fly the Destiny.” Dal’s voice was a gripping force, holding him back. After watching his love leave on a colony ship, James Wilfred must save those left behind from a planetary apocalypse. Their salvation lies in an unfinished ship tucked away in a secret government base, and only James can break in and pilot him and his people to freedom on a nearby space station. Skye O’Connor’s boyfriend never returns after his gang attempts an assassination of the Governor, and the State Building is destroyed. Worse, crazed moonshiners addicted to the chemical Morpheus have stormed the city, and she must find a safe place for her and her boyfriend’s daughter. 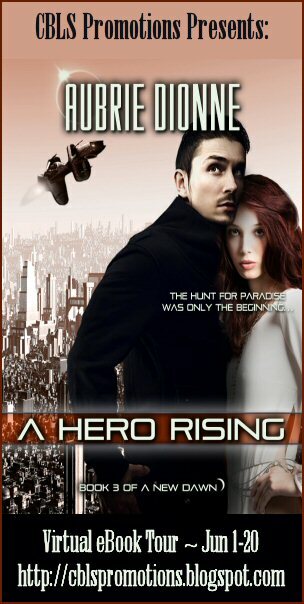 When a heroic man saves her, Skye asks to accompany him on his quest to find the last colony ship left on Earth. 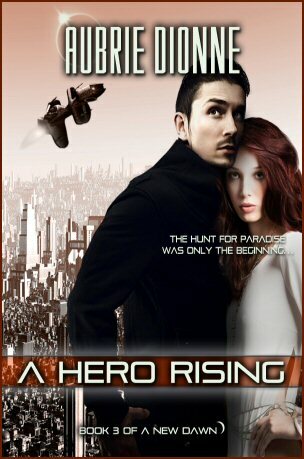 As the city falls around them, James and Skye must work together to build a new future, all the while rediscovering their ability to love, before the apocalypse claims them both. Aubrie Dionne is an author and flutist in New England. Her writings have appeared in Mindflights, Niteblade, Silver Blade, Emerald Tales, Hazard Cat, Moon Drenched Fables, A Fly in Amber, and Aurora Wolf. Her books are published by Entangled Publishing, Lyrical Press, and Gypsy Shadow Publishing. She recently signed her YA sci fi novel with Inkspell Publishing titled: Colonization: Paradise 21, which will release in October 2012. When she's not writing, Aubrie teaches flute and plays in orchestras. She's a big Star Trek TNG fan, as well as Star Wars and Serenity. Her dogs are appropriately named Jedi and Princess Leia. 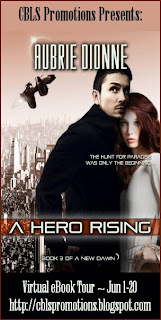 Enter below to win a eBook copy of A Hero Rising (New Dawn Series, Book #3) by Aubrie Dionne! Enter via the Rafflecopter form. Open INT.